This is a great place to combine work and play. There’s every amenity you could want, from a fully equipped gym to an office complete with an internet connection, phone line, fax line, printer, copier, and scanner. In the late afternoon, head to the tennis courts for a couple of sets before dinner, then finish up your day with drinks on the terrace while the sun sinks over the horizon. 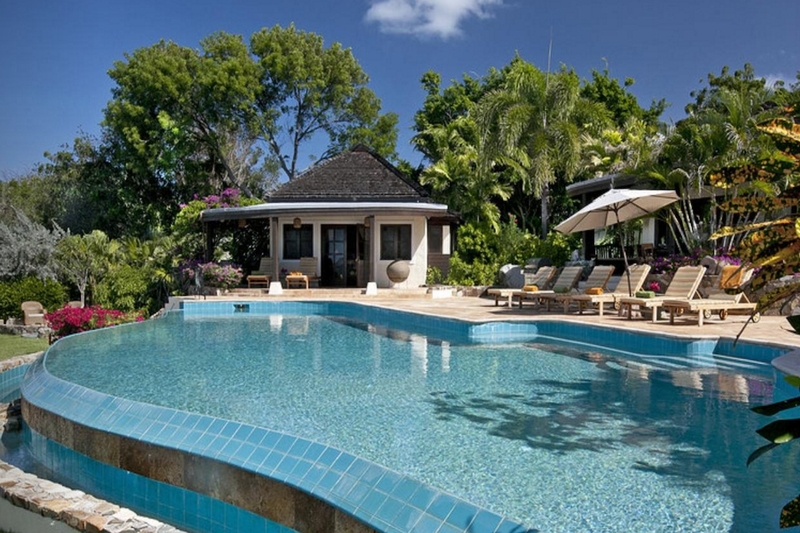 Sol y Sombra is a fully gated beach estate with two white sand beaches just steps away. Two carved gates open to the lush property, and a coral stone staircase leads through the landscaped gardens to a group of four pavilions. Sol y Sombra is totally equipped for any island adventure, with two bicycles, two ocean kayaks, two paddle boards, snorkel gear, life jackets, pool floats, beach chairs, umbrellas, beach toys, and a cooler. The coral stone terrace has several loungers and gardens, and borders the infinity-edge lagoon pool. An air-conditioned gym offers a treadmill, step machine, recumbent bike, a weight bench, free weights, satellite TV, and a fridge. The home’s tennis court is an artificial grass court that’s lit at night, and has a basketball hoop and tennis racquets. Take in the ocean view from the villa’s observation deck, which has two hammocks and is accessed by spiral stairs. A cook is available by request and the housekeeper does not live on the estate, so privacy is assured. The main pavilion has a shaded terrace with a wet bar and connects to the gym. Inside, there’s a living room with an entertainment system, a formal dining room, and a gourmet kitchen. The living room has a Sony Home Theatre projector, a TV, complimentary pay-per-view movies, surround system, an Xbox, games, and a DVD player. The kitchen is fully equipped with a Viking gas range, wine fridge, margarita machine, Nespresso machine, Sub Zero, and Cuisinart appliances. There’s also an office with a computer, a printer/scanner/copier, fax, cable TV, a phone, and a half bath. The Sugar Mill Pavilion is at the other end of the pool, built around huge smooth boulders. The pavilion has two air-conditioned master suites, a covered veranda, and a balcony. The lower level suite has a walk-in closet, a bathroom with an al fresco shower. The Tennis Cottage has two bedrooms, one has two daybeds and an ensuite bathroom, and the other is a king suite with an ensuite bathroom, mini fridge, entertainment center, and a private terrace. The Master Bedroom Pavilion has a king bed, private terrace, and an ensuite bathroom with an outdoor shower. Sol y Sombra is on beautiful, secluded Little Trunk Bay. Valley Trunk and Spring Bay are on either side of Little Trunk, so guests can explore various coves with ease. Little Trunk Bay Beach is just steps away! It's a 10-minute walk to the Baths. Guests will be greeted at the airport or ferry dock by a member of the villa staff, and will follow them to the villa in their rental car.